In every city you enter, you find uninhabited ruins. You hide in them when you need shelter. You search them for food, clothing or valuale stuff. 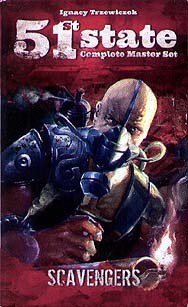 Scavenger contains 50 new cards - for use with 51st State: Complete Master Set. The Scavenger expansion introduces new card abilities, including the possibility of drawing the topmost card of the discard pile or building ruins, and developing your locations on top of them.